Yesterday (April 1, 2019), Zehan Xu defended his MS thesis Customer Attrition Modeling and Forecasting. Zehan received his B.S. degree in Industrial and Systems Engineering from Virginia Tech in 2016. He joined our MSEM program in Fall 2017. During his first semester, I gave a seminary talk about the research opportunities at BigDEAL. He approached me after that, passed the tests I gave him, and officially joined my research group in February 2018. 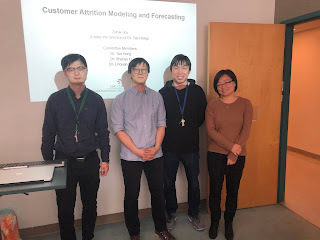 Knowing his solid math background, I asked him to work on forecasting customer count using survival analysis. The topic was an extension of Jingrui Xie's MS thesis and TSG paper. Since Zehan did not have much background in statistics, he had to teach himself about survival analysis. He quickly figured out that the tools working well on those textbook examples are not optimal for the real-world datasets I gave him. During the past year, he has been refining his work and finally came up with an effective methodology. Our original plan was to have him graduate at the end of 2018, when I considered the quality of his work exceed a MS thesis level. Nevertheless, he was never satisfied until very recently. I stopped by my office last Sunday, and saw one of my student Saurabh Sangamwar in the conference room presenting something. Since Saurabh already defended his thesis a month ago, I was a little curious. I went in and found him and another BigDEAL student Yike Li working with Zehan on Zehan's defense rehearsal. I thought Zehan's defense preparation was done, but apparently he was pursuing that perfection. His defense was very well done. I was impressed! While advising him for the thesis research, I found Zehan a great candidate for doctoral research. He also realized the need and value of advanced education, so he decided to continue pursuing his doctoral degree here at BigDEAL.